Refill your favorite car care product – without the mess! Threaded Refill Funnels feature staggered threads that are designed to fit a variety of different bottle sizes from your favorite car care manufacturers, including but not limited to: Wolfgang, Pinnacle, McKee's 37, Diamondite, BLACKFIRE, Marine 31, Griot’s Garage, Duragloss, Optimum Polymer Technologies, and more! Fits bottles ranging from 4 to 35 ounces! Threaded Refill Funnels also feature a spout so if you accidentally overfill the bottle, simple pour the excess back into your half gallon or gallon sized jug. Since the funnels screw onto the bottle, you don’t have to worry about holding the funnel with one hand and the jug with the other! Threaded Refill Funnels also feature a hook so you can attach them to a half gallon or gallon sized jug. This also helps prevent cross contamination between various chemicals. 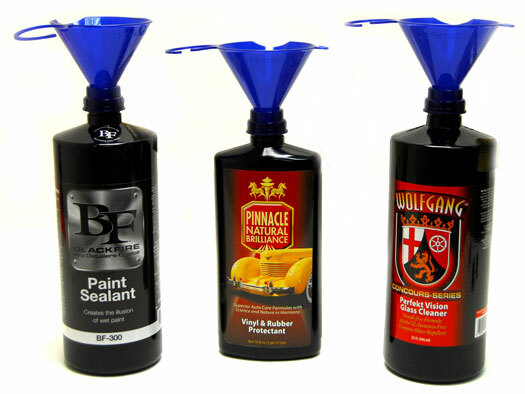 Stop making a mess of your detailing shop with accidental spills and pick up a set of Threaded Refill Funnels! Because they're small and have no vent, the funnel fills up too easily w/o 'flowing'. You have to wait for the 'glug glug glug' to continue. It's a pain trying to fill a 32oz or even 16oz refill bottle. What it needs is a small molded in 'straw' or vent so the fluid can flow. Better off just getting a decent size 'normal' funnel. Another convenience tool - these make refilling spray bottles easy! Having three is great for multiple uses and I appreciate the clip that leaves these attached to the bottle. These are great funnels but they are super small other than that they are great ..
ConsNone but in hind site I should have ordered another set of 3 can always use them for refilling something. If you buy bulk half gallon or gallon jugs these are great for transferring into your smaller spray bottles.